Happy Memorial Day weekend! I hope all of you had a long weekend full of relaxing, great barbeque food and fun with friends and family! We stayed home, but had a chance to visit with friends we don’t spend a lot of time with. It’s been great catching up, and exploring some new spots around town! To finish up a delicious weekend, we made a recipe for the Food Matters Project! There is no host this week, rather, it’s a Wild Card post- you can pick your favorite spring/summer recipe. We went a different route, and chose a FMP recipe which was already posted before, but we had not made it that week. It sounded delicious, we had all of the ingredients (when does that happen? ), and wanted a side with our dinner. Last summer we attempted fritters for a Food Matters Project recipe. They didn’t turn out as expected, but a cook can never give up (try, try, try again!). This was a fast recipe, although it does involve a bit of frying- so it’s probably not the best for a mid-summer recipe. But DC’s weather was a bit gloomy today, and cool enough to keep our windows open- so I figured this would be worth a shot! We served these fritters with a Greek Salad, a more flavorful option to a slice of bread! 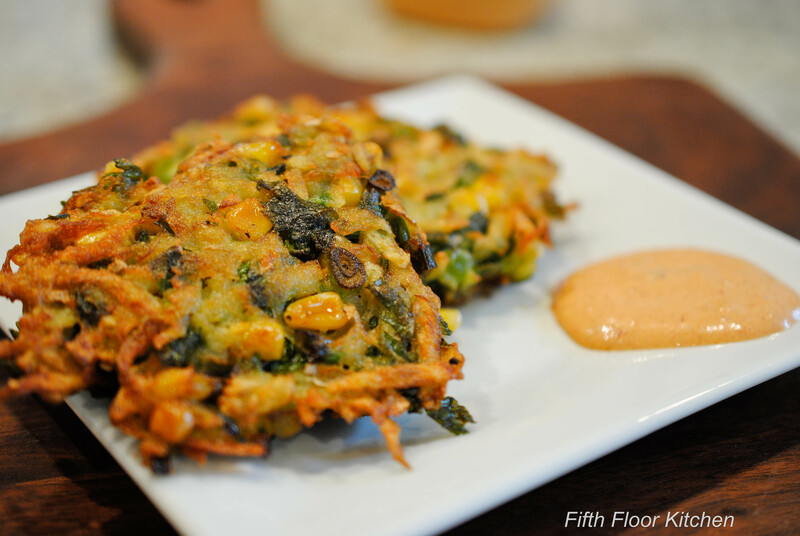 Check out how other FMP participants made this Sweet Potato and Corn Fritters with Thai Dipping Sauce recipe (back in November!). We served these fritters with a dollop of our Spicy Mayo Sauce. Definitely worth making for this recipe, or for other dishes as a topping. In a medium bowl mix together the poatoes, corn, jalapeño, green onions, cilantro, egg, flour, salt and pepper. This can be done ahead of time and refrigerated for a couple of hours before cooking. Pour about 1/8 inch of oil into a large skillet over medium heat. When the oil is hot, drop about a 1/4 cup of potato mixture into the oil and allow it to spread out. Cook until golden brown, then turn once and cook again. Both sides should be cooked in about 5 minutes. Serve hot, or at room temperature. We recommend frying these in batches (of about 2-3), so the pan does not get too overcrowded. This entry was posted in Food Matters Projects, Veggies and tagged cilantro, corn, corn fritters, dipping sauce recipe, FMP, Food Matters Cookbok, Food Matters Project, green onions, jalapeno, Mark Bittman, Memorial Day, poatoes, Potato and Corn Fritters, vegetarian. Bookmark the permalink. Thanks Olga! They were really good actually (not spicy either, even with the jalapeno in it). Was a little surprised how delicious they were! I guess that’s the perk of trying new recipes? Thanks Lexi! These turned out so well, I can’t wait to make them for someone else. Didn’t think that they’d be that delicious- but some recipes definitely surprise you!